Yangon - Rainbow flags flew high and gay anthems blasted out over Yangon's river as a flotilla of boats took to the water of Myanmar's biggest city on Saturday for the country's first-ever Pride boat parade in a sign of growing acceptance for LGBT rights. 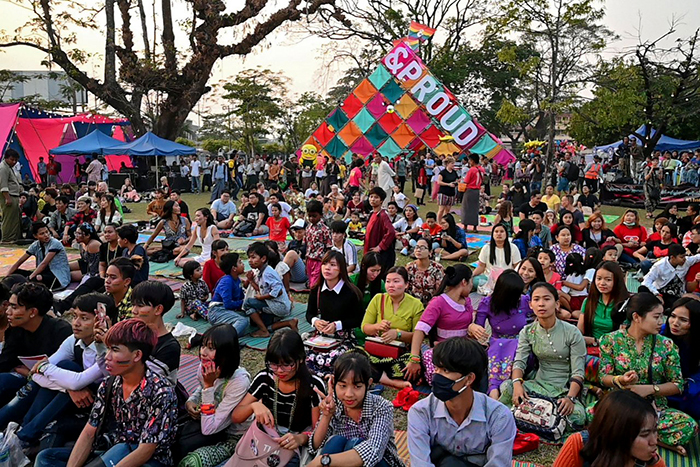 Compared to just five years ago when the festival got off the ground, "Myanmar LGBT people, especially young people, are now more courageous and more 'out'," said Hla Myat Tun, co-director of &Proud, which organises the celebration and other events across the country. Last year marked a milestone after authorities granted permission to hold the event for the first time in a public park with some 12,000 people coming along. Flushed with their success, organisers re-branded this year's event as a true 'Pride', even if a full march through the streets remains an elusive goal in a country still wary of protests. The boat party kicked off the packed programme of events that will include films, debates and the much-anticipated drag queen Olympics, featuring handbag throwing and stiletto races. Perceptions can be very different away from the main cities and many LGBT people often still face discrimination in the socially-conservative country. The festival's theme this year is "Heroes" to celebrate those who are standing up to fight for the community. Macho actor Okkar Min Maung was recognised as a role model after shocking the country with his coming out Facebook video last year. He was travelling in the US, but his mother accepted the award on his behalf, saying she was happy to have a gay son. "At work people didn't accept me being gay. I was quite depressed, but I don't have that feeling any more."